Megan Bugg's Journey – Page 79 – Megan Bugg's journey through cancer as told by her father. #13 is actually a lucky number for Megan. She is closing in on day 13 of her recovery from stage 4 alveolar rhabdomyosarcoma cancer. Megan just got finished telling me that this was the best she has felt yet. She only had stomach cramps twice today, and she was able to eat pretty well, which is very important for her. As I have state in previous posts, we are working hard to get Megan’s weight back up prior to her second chemo cycle, which starts on January 26. However, in addition to feeling better and eating well, Megan had some other very exciting things happen today. At about 10:30 a.m. today, her Grandpa and Grandma Bugg came to visit her. They are staying overnight with us, so pictures with them will be posted tomorrow. Megan was happy to see them, and we are so pleased they were able to make the long trip to spend some time with our family. They are wonderful people and our girls love them both. 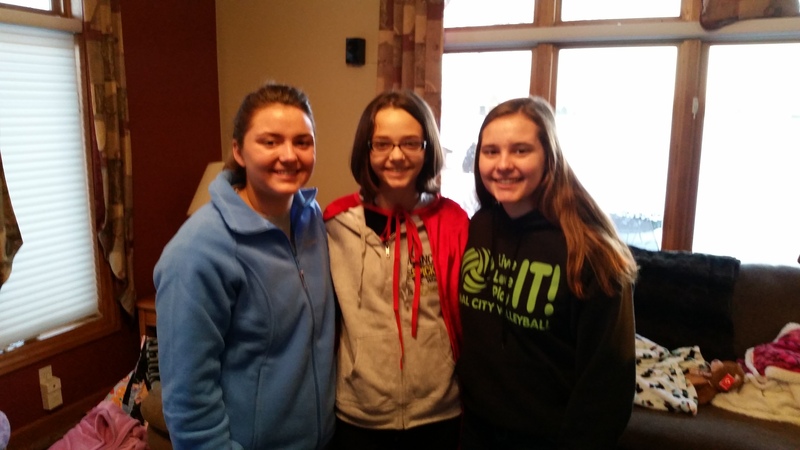 At about 3:30 p.m. today, Megan was visited by her friends, Emma Byers, Sam Olsen and Makenna Emerson. She was a little tired this afternoon, but seeing them perked her right up. She was also excited when she received this video from Mrs. Ness’ 4th grade class at Coal City Intermediate School. Putting together the video was so nice of Mrs. Ness and her students, and it really made Megan happy. Thanks to all of them for their kindness and consideration. 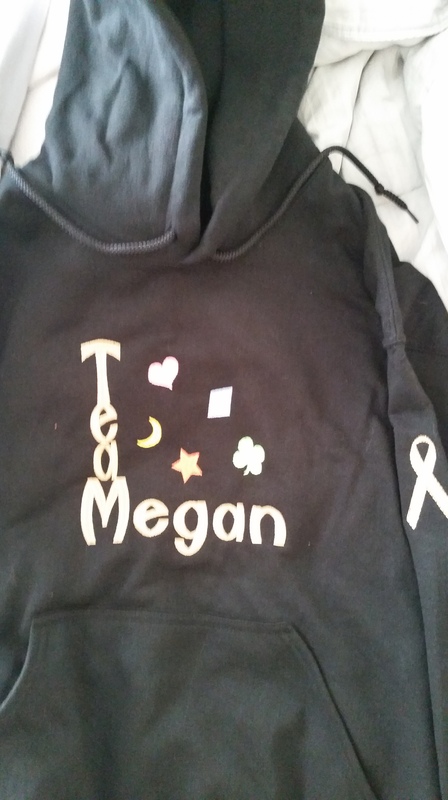 Megan also continues to receive some really thoughtful pictures from people who have joined “Team Megan”. Here is one from the 7th grade Warrior basketball team from Coal City Middle School. Thanks to Coach McCleary and all of his players. Also , here is another one from some of the wonderful students at CCMS. Even though Megan’s health has not allowed her to get to the middle school yet, our entire family is so appreciative of the tremendous support and consideration the staff and students of CCMS have shown her during this difficult and challenging ordeal. We truly have fantastic students in our school district, and I am so proud of all of them. 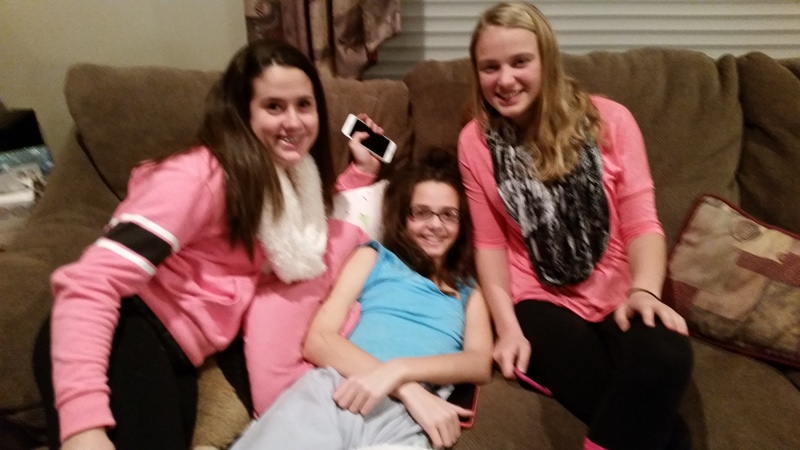 Megan’s older sister, Mackenzie had a basketball game tonight, but Megan did not feel well enough to attend. However, she was really excited when she called one of her favorite people in the world, Tammie Hall, and found out she would come and visit her while her mother and I attended the game. Tammie was the babysitter to both of our girls when they were younger, and we are so fortunate that “Aunt Tammie” has continued to be such an important part of their lives. By the way, Kenzi started for the sophomore team and scored all ten of our team’s fourth quarter points to help lead us to victory. She put on quite a performance for her grandpa and grandma! She also played about three quarters of the varsity game, which we won as well. She had a great night, and the varsity is still undefeated in the conference! When we got home from the game, Megan had a big surprise waiting for her. Megan is a huge Chicago Bulls fan, and her favorite player is Joakim Noah. Thanks to Coal City High School graduate, Jenna Wharrie, Megan was absolutely blown away tonight. 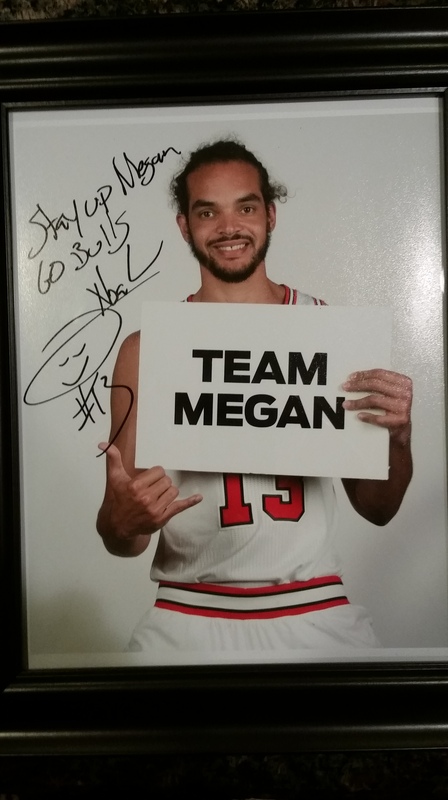 Joakim Noah has officially joined “Team Megan”!!! Megan could not have been more excited!!! Thanks to Joakim Noah for taking the time out of his schedule to make her day. Also, many thanks to Jenna Wharrie for making this happen for her. By the way, Joakim Noah wears lucky #13!!! #13 was definitely a lucky number for Megan today. The kindness and compassion shown by people inside and outside of our wonderful community continues to amaze us. 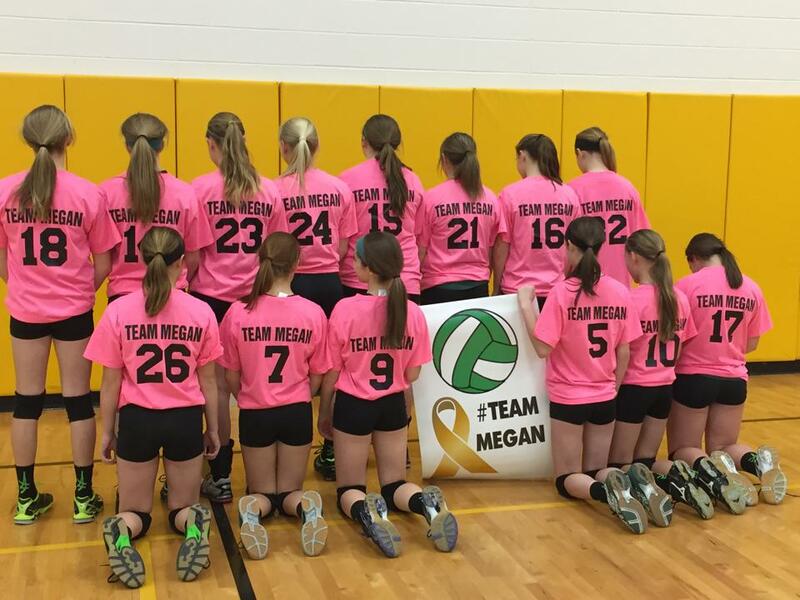 “Team Megan” continues to lift her spirits and help carry her down the road of this incredibly difficult journey. 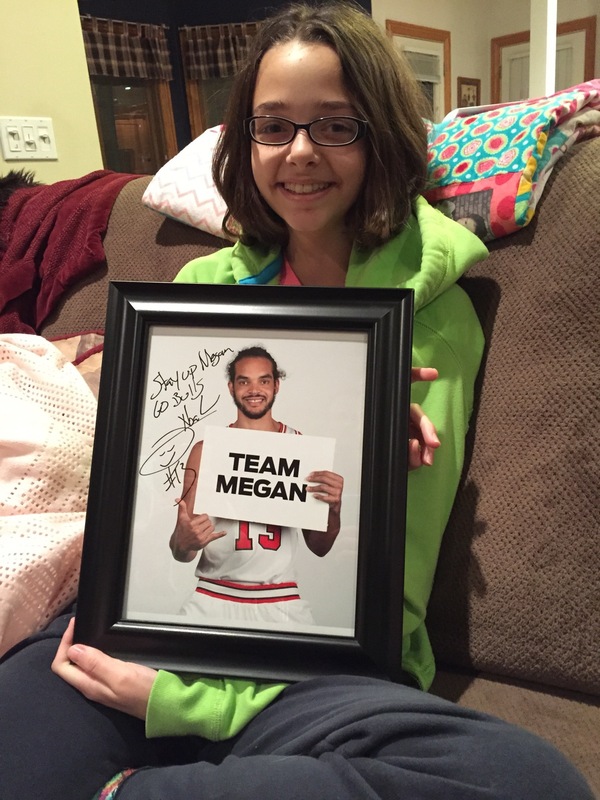 Megan is now one day closer to recovery, and “Team Megan” has gained the services of a very kind and gentle giant…Thanks Joakim!!! We are at the conclusion of Day 12 of Megan’s recovery from stage 4 alveolar rhabdomyosarcoma cancer. Today was by far the best she has felt since the start of this challenging ordeal. Although at times she still fought some stomach cramps, she was able to eat pretty well and without nausea. She even had one of those odd cravings: an 8:30 a.m. corn dog!!! Overall, today was a pretty low key day. Megan had a few visitors and received some really thoughtful cards and gifts, but really, it was a pretty normal day. However, what I came to realize today is that “normal” means something very different for Megan than it did pre-cancer. The “normal” Wednesday morning for Megan used to consist of getting up early to get ready for school. Making sure she had her lunch packed and her athletic bag packed for the volleyball game after school. “Normal” used to mean coming home after the volleyball game, grabbing something quick to eat and then sitting at the breakfast bar to get her homework done. “Normal” used to be her parents making sure her volleyball uniform was washed for the next game. Telling her to put her phone away and get to sleep was “normal”. At times, it is still heartbreaking to know that cancer has stolen the old “normal” away from her and replaced it with this new “normal”. Through the amazing support of everyone on “Team Megan”, she is adjusting to the new “normal” and making the very best of a tough situation. Today, Megan felt well enough that she actually accompanied me on a few errands around town. We stopped at the post office, the dry cleaners, the bank, and made a trip to my office to see everyone. Everyone in my office made Megan feel special, which I know she appreciated. They are all such wonderful people…and I miss seeing them everyday. One of her daily highlights is when the mail comes at about 1:30 p.m. each day, because she gets to open the cards and gifts that keep pouring in from all of her incredible and kind supporters. Today, she received a couple of things that she thought were pretty neat. The first was sent by my good friend Pete Hughes. 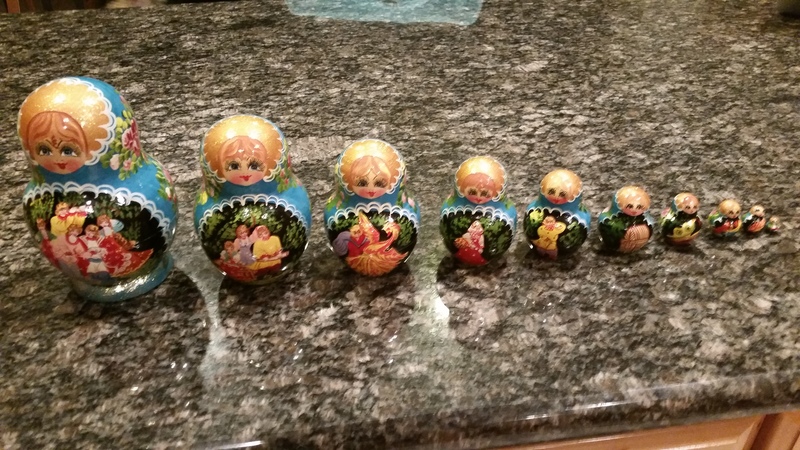 Pete makes a missionary trip to Russia every year, and he sent Megan a nesting doll that was actually made in Russia. What made this one unique is that it had 10 different layers, which is more than the customary 6-8 layers. Megan really enjoyed the thoughtful gift. Megan also received a visit today from Kim Scerine. Since Megan had been having so many issues with nausea, Miss Kim thought she should at least puke in style. Megan got a kick out of that!!! We just hope she doesn’t have to use it anytime soon!!! Kim was also kind enough to hang out with Megan for almost two hours and look at dance costume catalogs. Megan loves dance, so she really enjoyed it when Kim was asking her opinion on costume choices. 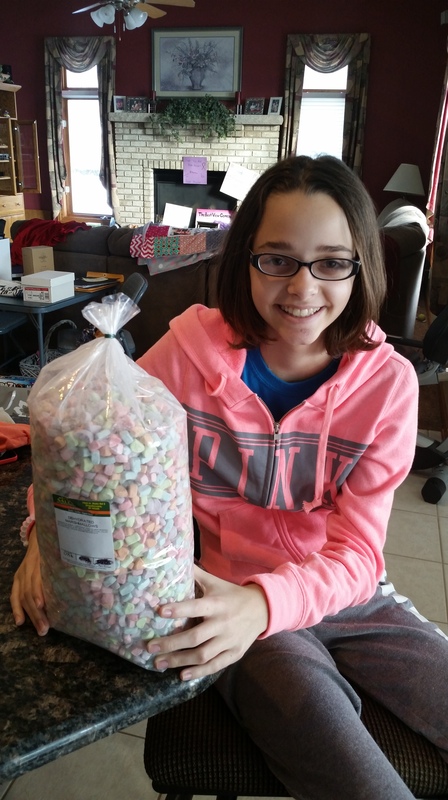 As readers of this blog know, Megan has had a recent affinity for Lucky Charms. Who can honestly say they don’t eat the marshmallows first? With that in mind, Megan received a bag of just the marshmallows today. It doesn’t get much better than that!!! Thanks to the Dixon family from Braidwood for that thoughtful, and fun, gift. 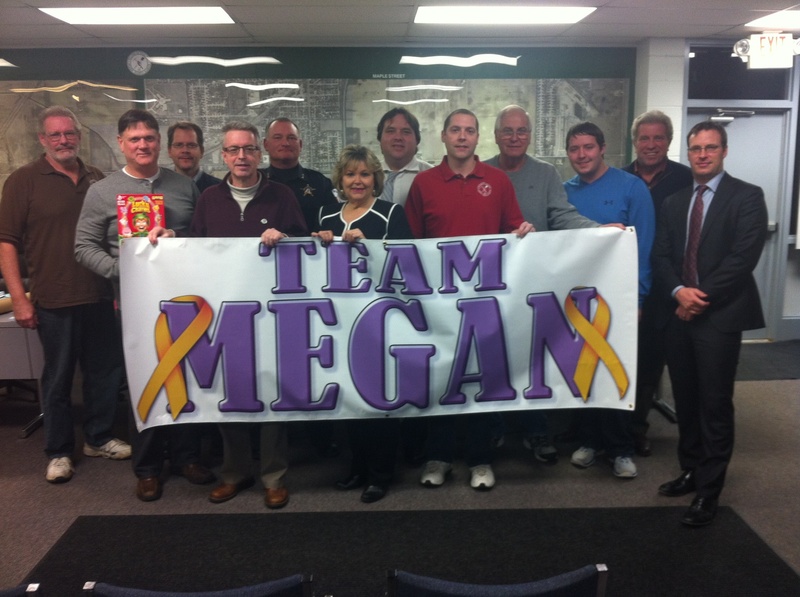 So many wonderful people have joined “Team Megan” to support her in her battle with this awful disease. “Team Megan” has even hit the sorority scene now. Megan’s Grandma Judy has another granddaughter, Stephanie Engel. 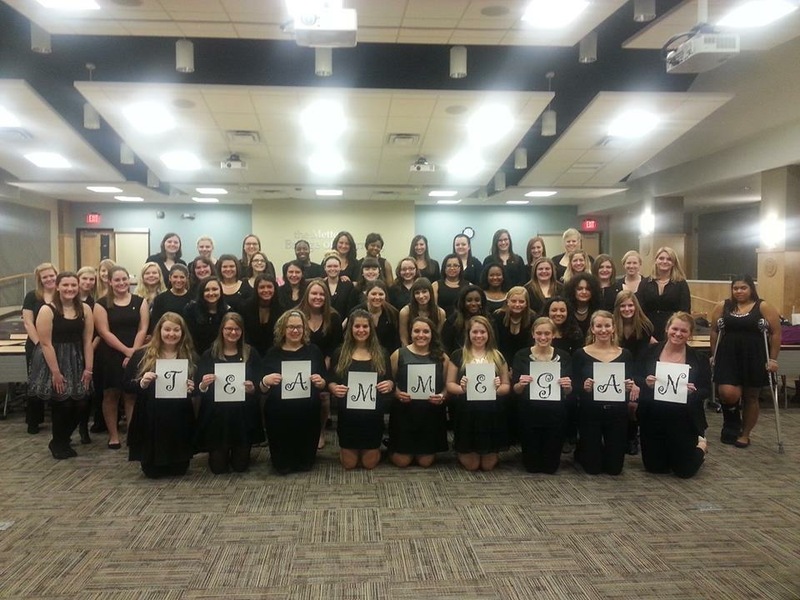 Stephanie’s sisters of DPhiE showed their support in this picture. Megan really enjoyed that. Thanks Stephanie!!! Until Megan’s ultimate defeat of cancer, she now has a new “normal”. However, everyone on “Team Megan” has helped her, and her family, realize that although this new “normal” can be scary, frustrating and daunting, it can also be full of beautiful experiences. Without the love and support everyone has showed Megan and our family, we might have missed the beauty. Thanks for not allowing us miss it. We are grateful to all of you. I want a Sausage McMuffin with no egg from McDonalds! She ate that and had some apple juice. Then at about 9:30 a.m. she wanted another Sausage McMuffin and a mango/pineapple smoothie. So once again, I made the trip to pick them up for her. She ate the entire sandwich and drank about 3/4 of the smoothie, which was great! She had some stomach cramps after that, but it wasn’t too bad. Hopefully, we continue to make progress with her appetite and her weight gain. Thanks to all of you who have offered to donate a few pounds to her!!! I only wish there was a way to make that happen!!! One of the many side effects of these brutal chemo treatments is that it can impact vision. 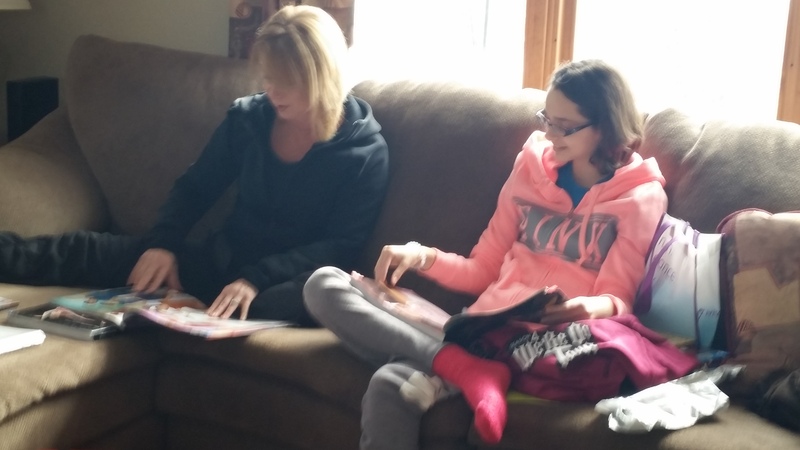 Since the chemo started, Megan has had trouble seeing things close to her, which makes reading difficult. We made an appointment to see Dr. Jon Micetich at Family Eye Care in Coal City. He made us feel much better by stating that Megan’s sight issues were very common in chemo patients. He also said that the problems would stabilize over time, and that there should not be any permanent damage. That was a relief! Megan picked out some new glasses, and the Family Eye Care staff even gave her a gift. They were so kind and compassionate to her. 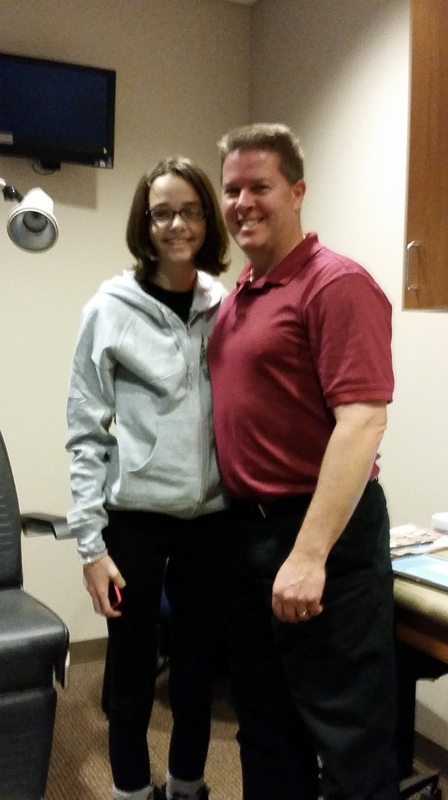 Dr. Micetich has always treated our family so well, and we really appreciate him taking such good care of Megan. He even posed for a picture with her. When we got home, Megan had quite a surprise waiting for her on the front porch. A large package was delivered and we had no idea who it was from. 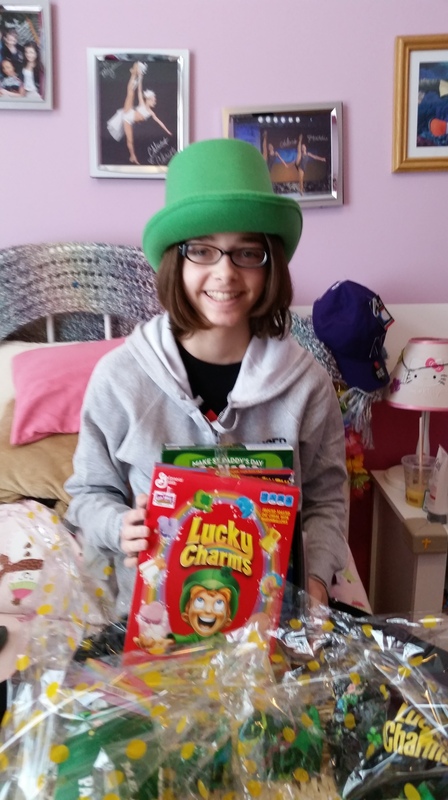 Those of you who have followed Megan’s strange food cravings know that after her first bout of nausea resulting from chemo, the first thing she wanted to eat were Lucky Charms. Apparently, that word has spread fast, because in the box was a huge Lucky Charms gift basket! Megan was even more excited when she read the card and found out it had been sent by the President of General Mills Big G Cereal Division, James Murphy. He even wrote her a personal note! His kindness really made Megan’s day. Megan was pretty tired after all the excitement, so in the afternoon, she went up to her room to rest. We have been watching my sister’s two cats for a few weeks because she changed jobs and is in the process of finding a new home. One of the kittens decided to keep Megan company in her bed. After Megan rested, she had some visitors stop over. Her Middle School Principal, Mr. Johnson and the Director of Special Populations, Sandy Rakes stopped by to visit and drop off some gifts and food. It was so nice of them to visit, and Megan enjoyed seeing them. Cancer Picked the Wrong Diva This Time! The cape is a perfect reminder to her that no matter what obstacles she encounters along this journey, she is strong and will be victorious. Thanks so much to the Olsen family for such a thoughtful gift. One of Megan’s favorite foods are the grilled chicken legs that our neighbor, Jeff Emerson makes. Megan requested them from him, and he braved the cold weather to grill them for her. Kortni Emerson also brought over spaghetti and bread. Megan ate two chicken legs, so we really appreciated them cooking for us…again!!! I hope Jeff has warmed up by now! 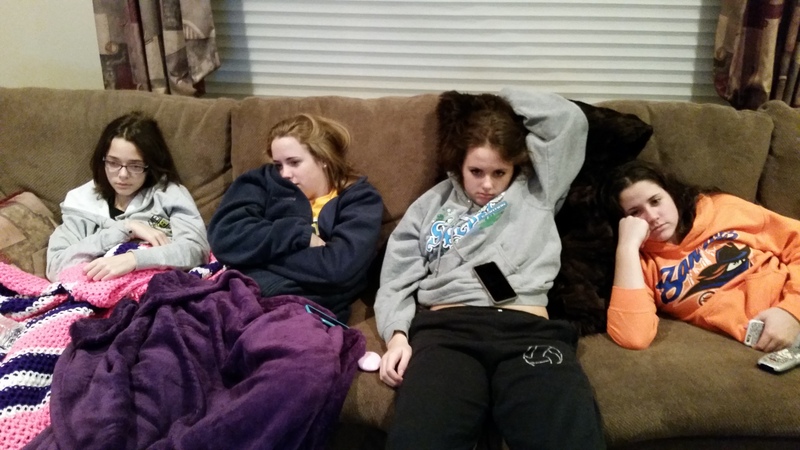 After supper, Megan, Mackenzie, and our neighbors, Makenna and Madison Emerson sat down to watch another riveting episode of “Dance Moms”. As you can see, they were mesmerized. Megan continues to get better everyday. Although she is still experiencing some stomach issues, they are becoming less and less frequent. She had a chemo treatment yesterday, and her doctor said she could experience some joint and jaw pain today or tomorrow. However, so far, so good. Hopefully, tomorrow we see even more improvement and no ill side effects from Monday’s chemo treatment. Megan continues to have an amazing attitude as she travels this difficult and challenging road. 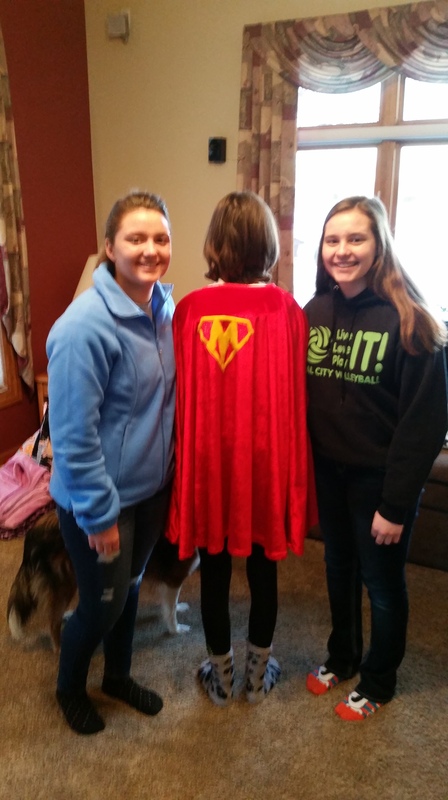 Not only does cancer have to deal with the power of “Team Megan”, but now cancer also has to reckon with “Super Megan”!!! Cancer is in big trouble!!! 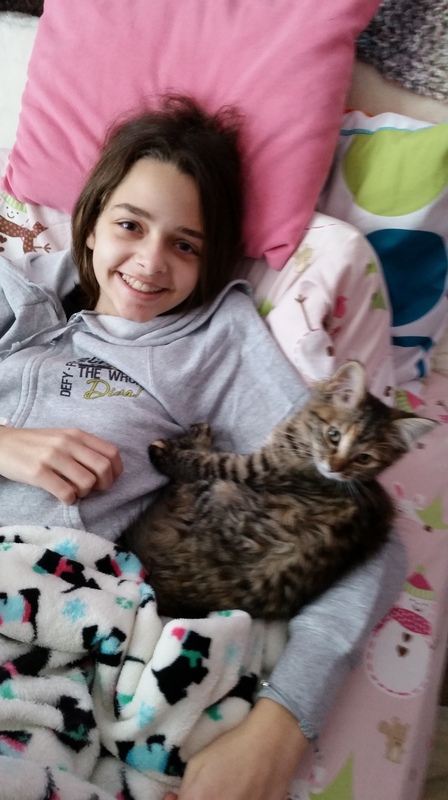 Day 10 of Megan’s recovery from Stage 4 alveolar rhabdomyosarcoma cancer is nearing an end. Day 10 consisted of Megan throwing up in the morning, going to Central DuPage Hospital for a chemo treatment, and fighting stomach cramps in the afternoon and evening. For most people, that sounds like a pretty bad day. However, for Megan, today was a truly “magical” day. It is true that Megan’s day started with her getting sick right before we were supposed to leave for the hospital. I think it was a combination of mild nausea and anxiety from knowing she was getting another chemo treatment that caused her to get sick. Following that unpleasant episode, she did not have any further nausea issues. For the past two days, she has been fighting stomach cramps more than the nausea. As you can see from this picture taken right before we left for the hospital, not even throwing up can wipe the smile off her face! We got there at about 9:30 a.m. and we immediately got called back to an outpatient room for the chemo treatment. Thankfully, the nurse we had was awesome and was able to access Megan’s port on the very first try. Megan doesn’t enjoy getting stuck with needles, so having such a great nurse was a blessing for her. They checked her blood counts, which thankfully are still good. There will most likely come a time when she has to undergo a blood transfusion before she can undergo her chemo treatments, but the longer we can put that off the better. Her chemo treatment was a push through the port as opposed to an infusion, so it was very quick. We then met with one of her oncologists, Dr. Hayani, who gave us some “magical” news. Megan’s tumors are starting to react to the chemo treatments, and all of them are reducing in size. He believes that most of them have gone down by about 50%!!! In fact, she had a rather large tumor on the top of her head that you cannot even feel anymore!!! This was such exciting news for Megan and our family. The doctor made it clear that by no means is she out of the woods yet. The chemo treatments still have a lot of work to do before she is cured, but we are sure off to a good start. 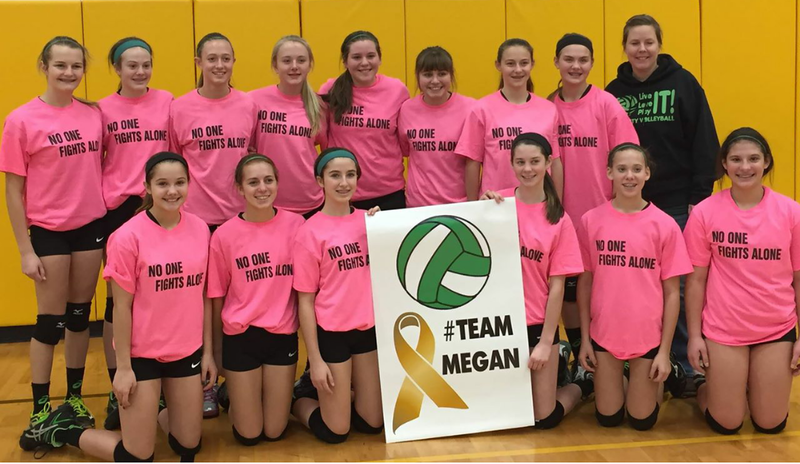 I know the medical treatments are working, but I firmly believe that the thoughts and prayers from everyone on “Team Megan” are making a huge difference. We are more convinced than ever that Megan’s doctors and “Team Megan” are going to help her beat down this terrible and senseless disease. It was truly “magical” news. After her appointment, she wanted to stop at Jimmy Johns for a slim roast beef with cheese and some chips. I’m happy to report that she ate 3/4 of the sandwich and about 1/3 of the chips. When we left, she wanted ice cream, so we stopped for a scoop of chocolate/marshmallow at Oberweis Dairy. She ate the entire cup!!! She also had some McDonald’s pancakes and a smoothie (Thanks to Emma Byers’ mom!). The doctor is still concerned about her weight loss, so he prescribed a new medication that is supposed to help her with her appetite. Although she is eating better, we still need to keep getting more calories in her stomach. Mackenzie had a basketball game against Wilmington tonight. Megan had planned on going, but about an hour before we were going to leave, she just didn’t feel well enough to go, so her good friend, Emma Byers, hung out with her instead. Mackenzie’s team won both the sophomore and the varsity games, and she started both. The varsity is still undefeated in the conference…Go Lady Coalers!!! While we were at the game, I received a text message with this picture from the Coal City Village Board. Megan thought it was pretty cool. Thanks to Mayor Nelson and all of the Coal City Village Board members for supporting “Team Megan” and helping her “magical” day to continue!! You may have noticed multiple references to “magic” throughout this post. That is because of an amazing YouTube video that was made for Megan by Tim Hannig. If you are not familiar with his work, he is an accomplished motivational speaker, entertainer and magician who performs at many schools. Megan thought this video was incredible, and we were all touched by the kindness and compassion Tim showed by making the video for her. The video also contained a fantastic inspirational message. I hope you get a chance to watch the it. Thanks so much to Tim for supporting Megan in her battle, and for topping off her “magical” day. Day 9 of Megan’s recover from alveolar rhabdomyosarcoma cancer is nearly complete. Following her first five day chemo cycle, each day continues to get progressively better. Chemo is a brutal drug, so she is still nowhere near where she was prior to treatment. However, the nausea has mostly subsided, which has allowed her to eat a little more. Instead, she now suffers from some severe abdominal cramping, which seems to come and go throughout the day. She also lacks energy, and just hasn’t felt well enough to get out of the house today. However, she has been eating a little more, which she really needs to do to prepare her body for the second chemo cycle, which starts on 1/26. I want a corn dog! So…I called “The Grill” and ordered two corn dogs at 3:30 in the afternoon. Within 15 minutes, Megan was devouring one of the corn dogs (the other one is still in the fridge…just in case that particular craving comes back!). So far, we have had Lucky Charms, milkshakes at 8:30 a.m., and now the afternoon corn dog. It will be interesting to see what is next. The good thing is that when Megan got on the scale tonight, she had gained three pounds!!! Now she is only down 7 pounds from her pre-chemo weight. We still have work to do over the next two weeks, but hopefully we are on the right track. There are obviously so many negative thoughts and emotions that come with learning that your child has Stage 4 cancer and with the ensuing battle that must be fought. I would never wish this experience on any child or family. However, one of the positive things that has resulted from this traumatic experience is that it has restored my faith in the goodness of people. In our home, and throughout our wonderful community, kindness, compassion, and caring have become the norm. The support that Megan and our family has received continues to blow me away. There have been so many people who have reached out to support Megan and to help our family that I could never mention everyone in this single blog post. However, I can give you some amazing examples of the incredible support our friends, family and community have provided. When Megan was released from the hospital following her five day hospital stay for round one of chemo, we had a long drive home after a very long day for Megan. However, when we got off at the Coal City exit from Interstate 55, here is the flashing sign we saw welcoming us home. There was one just off the interstate and another one on Carbon Hill Road, which is on the way to our home. It was incredible. We just learned that Kim Scerine was responsible for this. Thanks Kim!!! “Team Megan” has also provided her with so many cards, prayer wishes, and gifts that I could never list them all here. 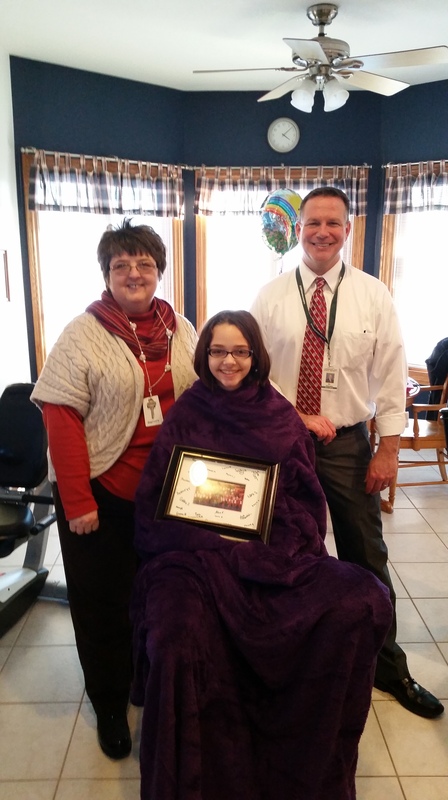 However, yesterday Megan received a gift from Pam Spreitzer that she found to be very special. 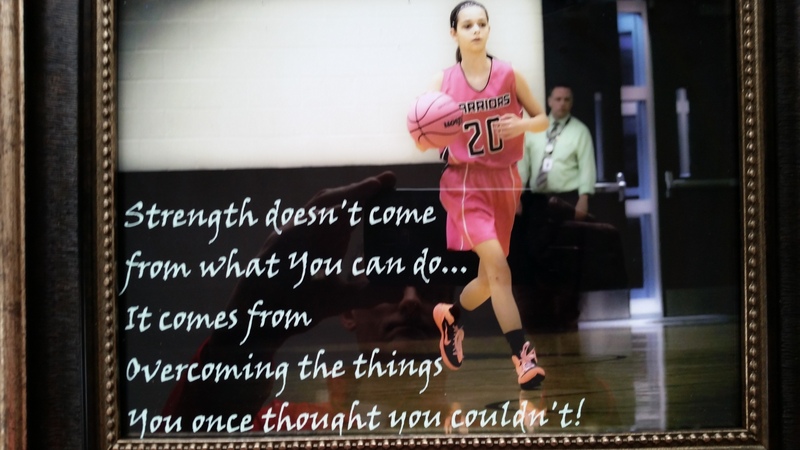 It is a picture of her from basketball season with a motivational quote that really struck her. Megan also received a very special gift from our wonderful neighbors, the Emersons. Not only was the blanket meaningful to Megan because it was a celebration of her long friendship with their family, but I think, in a way, it was also symbolic of how we have felt through this entire ordeal. 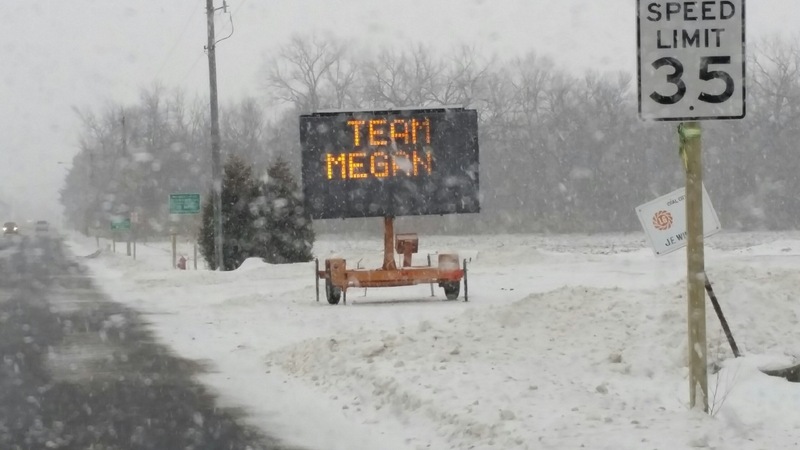 Megan and our family have been blanketed in kindness and compassion by everyone on “Team Megan”. Here is a picture of the blanket, along with some close up shots of the pictures on the blanket. 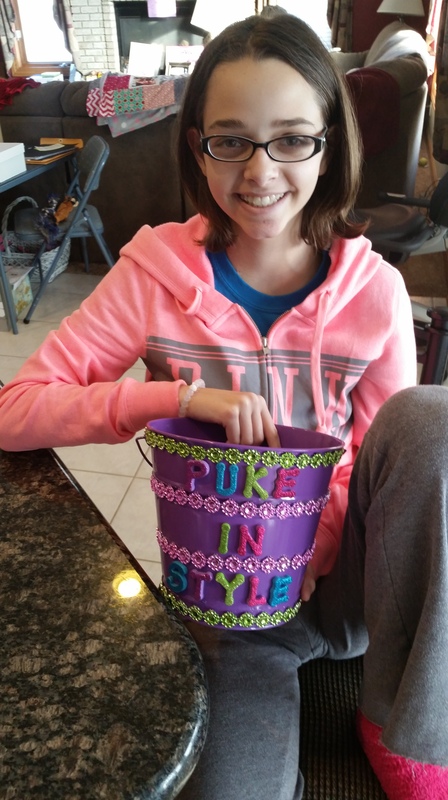 Although Megan is home, she still has to go for one chemo treatment per week at Lurie’s in Central Dupage Hospital. Tomorrow (Monday), we have to take Megan for her chemo treatment at 9:40 a.m. If all goes well, it should be an outpatient procedure and we will be home sometime in the afternoon. We are hoping that she doesn’t have too many negative side effects from this treatment. It truly takes an entire community to raise a child. It is humbling how this community has come to the support of Megan and our family during our time of need. We have been “blanketed” in kindness and compassion. 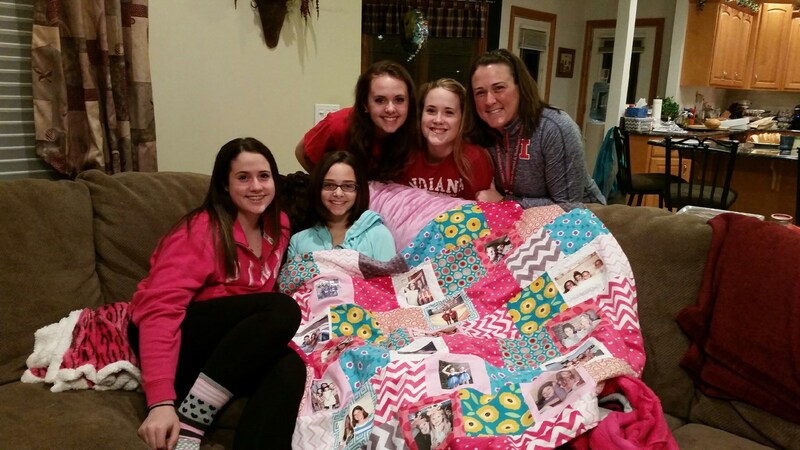 This “blanket” continues to give Megan the resolve she needs to beat down this awful disease…and beat it she will!!! “Team Megan” cannot be defeated!!! It’s hard to believe, but Day 10 is nearly upon us. Day 8 of Megan’s recovery from cancer is coming to a close, and it has been another successful day. Although Megan still has some intermittent stomach pain, her nausea seems to be under control. The new medication seems to be working well, but we still need her to get her appetite back. She has lost 10 pounds during her 8 recovery days, so we need to get some weight back on her prior to her second chemo cycle, which starts on January 26. This morning, she woke up at 6 a.m. and requested that I make biscuits and gravy for her, so that was a good start!!! We are hoping for her appetite to pick up a little each day. 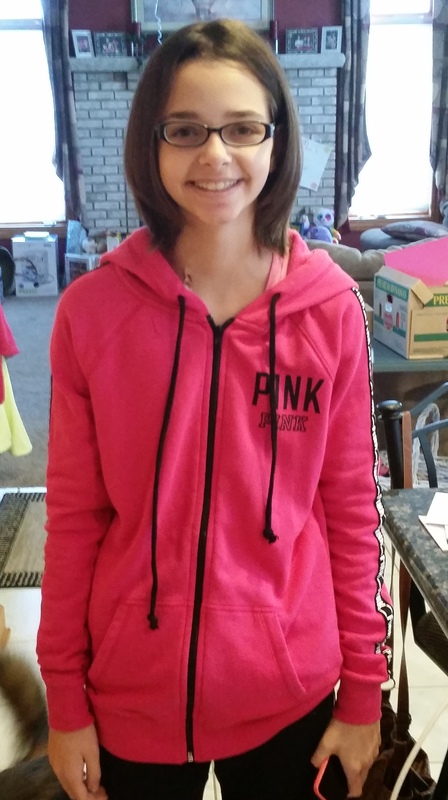 One of the highlights of today for Megan was feeling well enough to get her hair done at the salon by Toni Spencer. Megan is fully aware that losing her hair will be an eventual and inevitable ramification of her chemo treatments. Although she obviously isn’t happy about it, she is prepared to deal with it. To prepare for that, Toni has been gradually cutting her hair shorter. 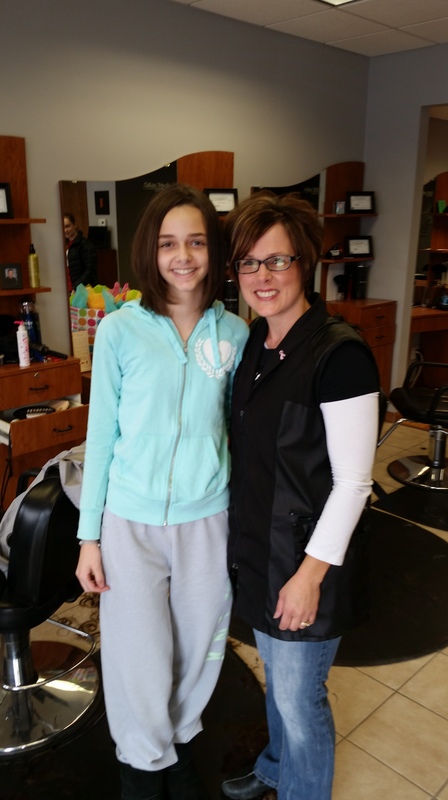 Megan agreed to get quite a bit cut off today, but Toni made her feel comfortable… and she looks gorgeous!!! Toni spent about an hour and a half with her giving her the full treatment. 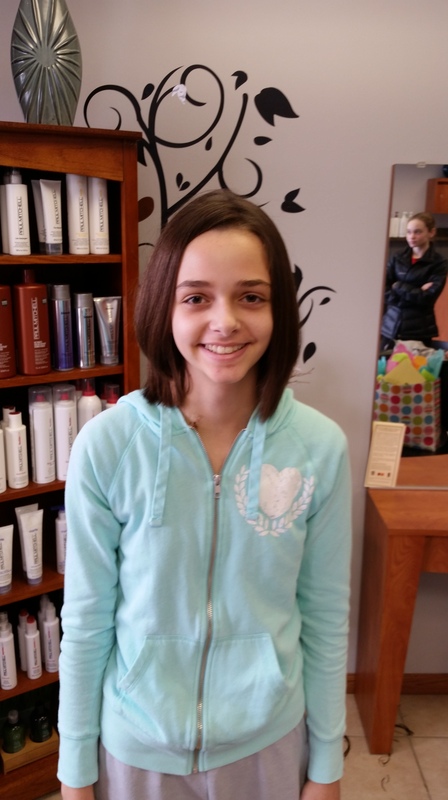 Megan was so happy with her new haircut. Our family could never thank Toni enough for doing this for her. She has been so good to Megan and our family throughout this journey. 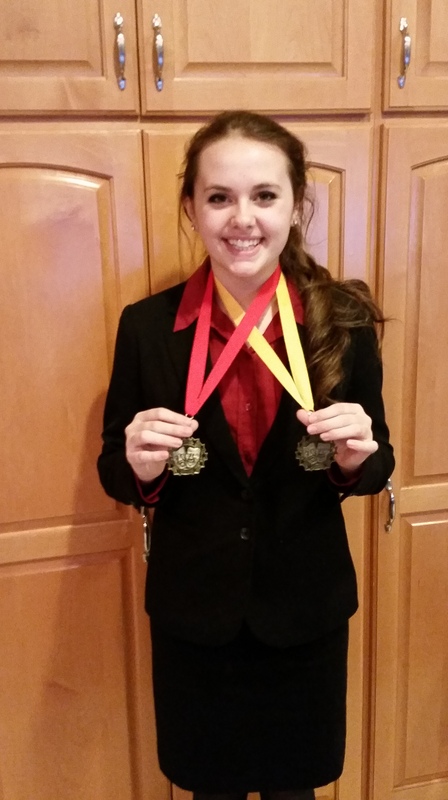 While we were at the salon, my wife called with the exciting news that Megan’s sister, Mackenzie, had made the finals in both of her speech events at the Reed-Custer Speech Meet. She finished 2nd in one of her events and 4th in the other. She had to get up at 6 a.m. to go to the speech meet, and that was after starting at last night’s varsity basketball game and playing in the sophomore game as well. Not bad for a sophomore in high school!!! 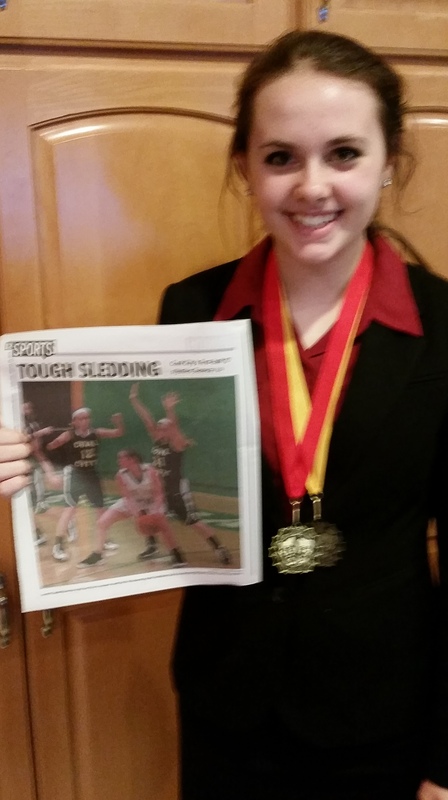 Here is a picture of her with her two medals from today, and a full page picture of her from last night’s basketball game that was in today’s Morris Daily Herald. We are so proud of her and all she is accomplishing!!! Megan’s favorite sport has always been volleyball, and she was really looking forward to this season. She was one of the starting setters in 6th and 7th grade, and she had high expectations for this season. Receiving the news that she had cancer meant that she could not longer participate in volleyball this year. She was able to attend the first two weeks of practice, but cancer marked the end of her season. However, her volleyball teammates and coaches had other ideas. The team played their first game today, and even though Megan couldn’t be there, her teammates and coach made sure she knew she was still a part of the team. 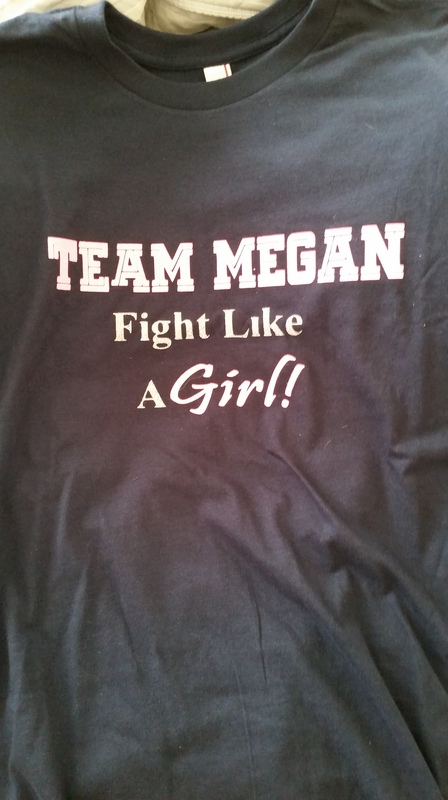 The girls had warm-up shirts made that honor “Team Megan”. 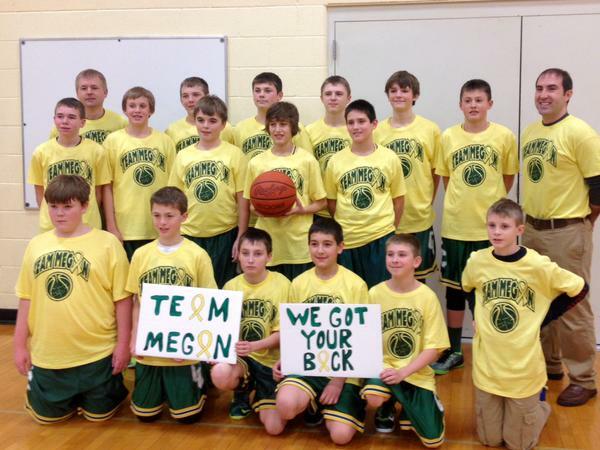 The front of the shirts say, “No One Fights Alone”, and the back says, “We Are Team Megan”. After their season opening victory, they took these pictures and sent them to Megan. Talk about a tear jerker!!! Megan and our family were so touched by their caring and kindness. It really made Megan’s day that the Warrior Team became “Team Megan” today. This battle is so much more tolerable when you aren’t fighting it alone. Megan also received some very special gifts today, but I am going to wait until tomorrow to blog about those, because I don’t want anything to take away from the kind and caring gesture of her volleyball team. Unfortunately, the news media likes to focus on the negatives with today’s teens. I fully recognize that bullying and aggressive behavior are real issues that need real attention. However, I also know that the vast majority of teens are kind and caring young people with huge hearts. 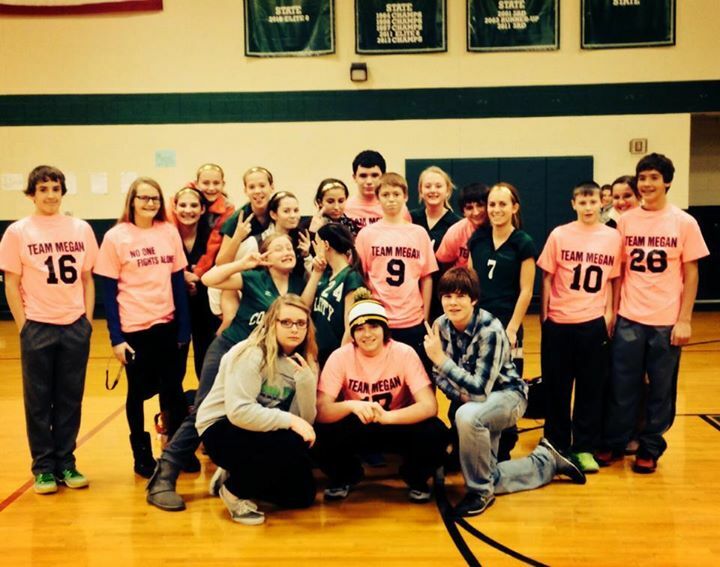 The Coal City Middle School 8th Grade Volleyball Team exemplified that today by showing their support for a fallen teammate. That is a gesture that Megan and our family will never ever forget. It is an honor to have her teammates and coach on “Team Megan”!!! Day 7 of Megan’s recovery from alveolar rhabdomyosarcoma is nearly over. The day started ominously, but ended in a joyous celebration with friends. Even though it was cold and windy today, the sun was shining…and for good reason. Megan’s day got off to a rough start. The nausea caused by the chemo treatments continued to plague her as she threw up at 4:15 a.m. Then she went back to sleep for a couple hours. At about 7:00 a.m., she asked for some Honey Nut Cheerios (Lucky Charms got edged out this morning!). 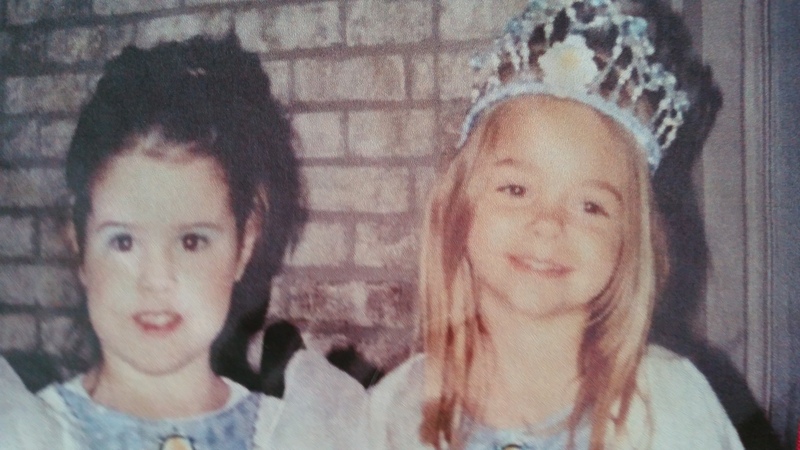 Her sister, Mackenzie, left for school at about 8:05 a.m., and when I went back upstairs, Megan was getting sick again. I felt so bad for her!!! However, at long last, relief was on the way. One of Megan’s biggest problems has been that her liquid nausea medicine actually made her sick. It’s never good when your anti-nausea medicine makes you nauseous! Thankfully, our wonderful neighbor, Kortni Emerson came through for us yet again. She is a nurse, and she found out that there was a pill form of a nausea medicine that might work for her. I called the nurse practitioner for Megan’s oncologists, who agreed and called in a prescription. Megan took the new medication at about 9:00 a.m.
After taking her new medication, she wanted a chocolate milkshake and a plain biscuit from McDonalds. About an hour later, she wanted oatmeal. Then she wanted some saltine crackers. Obviously, things were starting to look up. Later on she had some pancakes and some more apple juice. I’m thrilled to report that as of 10:00 p.m., Megan has not gotten sick!!! Maybe…just maybe…we are over the hump. Thanks Kortni!!!!! Megan actually felt good enough to have visitors this evening. I went to Mackenzie’s basketball game in Seneca tonight (we won! ), so I was not home when her visitors came. In fact, it was a little hectic for Mackenzie and Makenna Emerson to get out the door in time to meet the bus for the game. 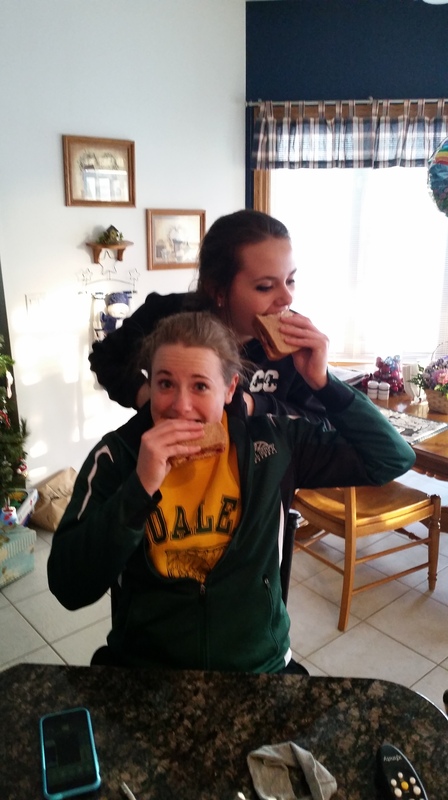 They had to eat and do their hair at the same time…What teamwork!!! 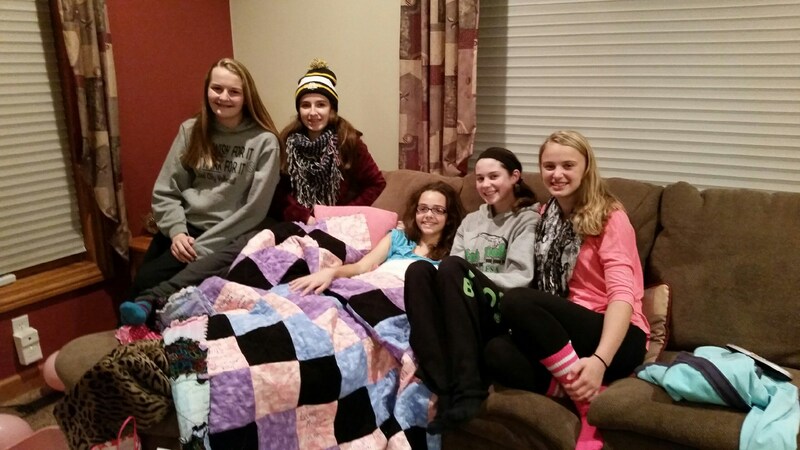 Megan’s friends from Coal City Middle School stopped to see her. They brought cards and gifts, but more important than that, they brought the gift of joy to Megan. 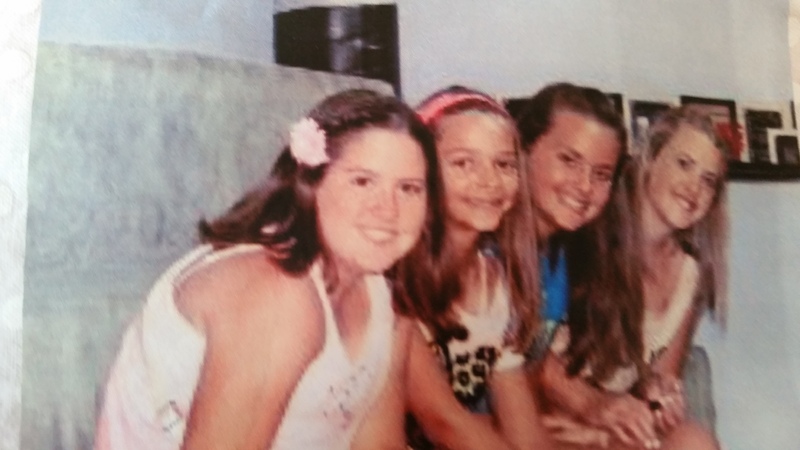 It was so nice of them to stop by, and I know Megan really appreciated their friendship and kindness. We are so thankful that Megan is finally feeling better, and we are so hopeful that she continues to improve each day she is home. It is important that she get her strength back over the next two weeks so her body is prepared for the challenge posed by the second round of chemo, which starts on January 26. The overwhelming support from this incredible community continues to amaze our family. 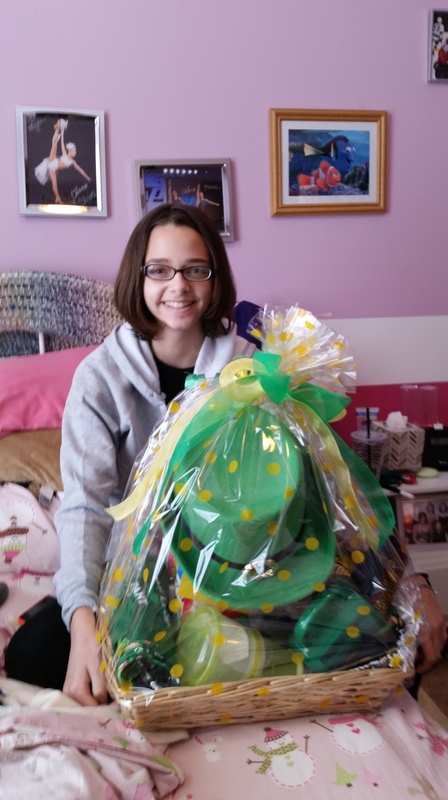 Megan has received so many touching cards and gifts, and each of them lifts her spirits even higher. Two very special gifts were received by our entire family. The family of one of Mackenzie’s classmates, Courtney Augello, had t-shirts made for each member of our family. Also, we received sweatshirts from the family of one of Megan’s classmates, Ben Hawkins. Ben was creative enough to work Lucky Charms into his design. Both of these generous gifts were so appreciated by our family!!! All of the support Megan has received from friends, family, and even people she has never met, continues to feed the fire inside of her necessary to beat down this terrible illness. Thank you so much to those of you who take the time to comment on this blog. In quiet times, I still read Megan the comments, and I know it brings her joy and comfort to know so many people are with her in this fight. The healing force of “Team Megan” continues to grow each day!!! Cancer messed with the wrong diva this time!